Alavia, S., Matin Yekta, M., Hadjiaghaee, R., Ajani, Y. (2008). Flavonoid Glycosides from Tribulus terrestris L. orientalis. Iranian Journal of Pharmaceutical Sciences, 4(3), 231-236. Seyed Hamid Reza Alavia; Marzieh Matin Yekta; Reza Hadjiaghaee; Yousef Ajani. "Flavonoid Glycosides from Tribulus terrestris L. orientalis". 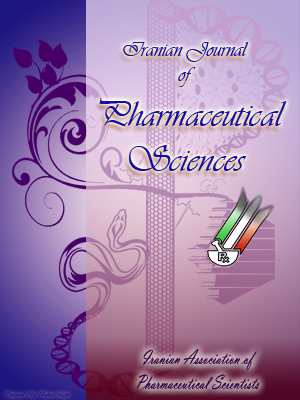 Iranian Journal of Pharmaceutical Sciences, 4, 3, 2008, 231-236. Alavia, S., Matin Yekta, M., Hadjiaghaee, R., Ajani, Y. (2008). 'Flavonoid Glycosides from Tribulus terrestris L. orientalis', Iranian Journal of Pharmaceutical Sciences, 4(3), pp. 231-236. Alavia, S., Matin Yekta, M., Hadjiaghaee, R., Ajani, Y. Flavonoid Glycosides from Tribulus terrestris L. orientalis. Iranian Journal of Pharmaceutical Sciences, 2008; 4(3): 231-236. Tribulus terrestris L. var. orientalis (Kerner) G. Beck is widely used in the traditional medicine of many countries. Several flavonoides are identified from the plant material. Aerial parts which collected from northeast of Iran are used in this study. Three flavonoid glycosides were isolated and characterized. The flovonoids were found to be based on quercetin and kaempferol. Flavonoid glycosides which separated were consisted of quercetin 3-O-glycoside, quercetin 3-O-rutinoside and kaempferol 3-O-glycoside. The latest one was a new for the plant. The genus Tribulus L. (Zygophyllaceae) has 25 species in the world . In the Flora Iranica four species have been reported for this genus which include T. terrestris L., T. pentandrus Forssk., T. ochroleucus Maire and T. longipetalus subsp. macropeterus. The former one is characterized by having four spines in mericarps of fruits in which two of them are shorter than two other ones. This species includes with three varieties: T. terrestris var. orientalis (Kerner) G. Beck, T. terrestris var. robustus Boiss., and T. terrestris var. bicornis (C. A. Mey) Hadidi . T. terrestris L. var. orientalis is a widespread and summer- tolerant plant which distributed in arid and semi-arid parts of the world include Africa, Middle East, East Asia, East, Center and South of Europe and Australia, Mediterranean region and SWAsia. The plant is distributed in most parts of Iran . T. terrestris L. is used in the traditional medicine of many countries for treatment of cardiac diseases, edema, eye trouble, skin disorders, urinary troubles and stones in the bladder and as a diuretic, aphrodisiac . It has been shown to increase the free serum testosterone  and to be effective in the treatment of sexual and erectile dysfunction by conversion of its phytochemical derivative, protodioscine to dehydro-epi androsterone (DHEA) . It has protective effect on genetic damage  and stimulates melanocyte proliferation in the treatment of vitiligo . Moreover, a nematocidal activity has been reported . Its action on motor activity, muscle tone and restorative tonic for vigor, and mainly used to improve performance in sports . The plant is reported to contain steroidal saponins, alkaloides, and flavonoides [10-16]. T. terrestris is also known for having antimicrobial, antiacetylcholine and haemolytic activity [17-19]. For treatment of kidney troubles, it is either used alone or in combination with Zea mays . The quantities and presence of important metabolites depend on the various parts of the plant used . There are no investigations on the flavonoides of it in Iran. In this article, we report the isolation and the structural charac-terization of two quercetin glycosides and one kaempferol glycoside. Table 1. UV data of flavonoid glycosides from T. terrestris var. orientalis. Aerial parts of the plant were collected which grows as weed in farming lands as dominated plant after harvesting crops. A voucher specimen (Golestan Province, 9 km E Kalaleh, near to Ajansangarly village, ca. 200 m, 11.8.2006, Ajani 10050) is deposited in the Central Herbarium of Medicinal Plants (ACECR), Karaj, and Tehran Province, Iran. Melting points were taken on a Reichert-Jung apparatus (Vienna, Austria). Ultraviolet spectra were recorded on a Shimadzu 160A spectrometer (Kyoto, Japan). Electron Ionization Mass Spectra (EIMS) were determined on a Finnigan MAT SQ 70 (California, USA) at 70eV. H-NMR and C-NMR spectra were measured in CDC13 with tetramethylsilane (TMS) as an internal standard using a varian 400 Unity plus spectrometer. FTIR spectra were recorded on a Nicolet 550 spectrometer (Madison, WI, USA). Column chromatography (CC) was conducted with silica gel (kieselgel 60, 60-100 mesh ASTM; Merck, Darmstalt, Germany) and thin-layer chromatography (TLC) with Merck silica gel 60 F254 on glass plates. The shade dried and powdered aerial parts (50 g) of the plant were extracted with 80% MeOH (2 l) by perculation for 72 h. The solvent was evaporated by vacuum distillation at 45 ºC to produce a gummy residue and 50% of methanolic extract was re-dissolved in MeOH and the 50% MeOH soluble part was partitioned by ethyl acetate. The 50% MeOH phase was subjected to column chromatography over silica gel (60-120 mesh) and eluted with CHCl3: MeOH mixtures with increasing concentrations methanol to give 4 fractions. Fraction 2 was re-chromatographed on a sephadex LH- 20 column using MeOH as eluent, to yield 1 and 2 (150, 100 mg). Fraction 4 was chromatographed on a silica gel CC and eluted with EtOAC: MeOH mixtures with increasing concentrations of methanol to give 3 fractions. Fraction 3 was rechromatographed on a sephadex LH- 20 column using MeOH as eluent to yield 3 (12 mg). The isolated flavonoides were identified by UV, 1H and 13C NMR and mild acid hydrolysis. UV, 1H and 13C NMR data of the isolated flavanones are shown in Tables 1 and 2. Acid hydrolysis: Compounds 1, 2 and 3 each in a mixture of HCl 8% and MeOH (2 ml) were separately refluxed for 2 h. The reaction mixtures were reduced in vacuum to dryness, dissolved in H 2O (2 ml) and neutralized with Na2CO3 . The neutralized products were subjected to TLC analysis (eluent: EtOAc- MeOH- H2O- HOAC, 6:2:1:1 and pc reluent: N-BuOH-HOAC-H2O (4:5:7) and C6H6-N- BuOH-H2O-Pyridin (1:5:3:3). The chromatograms were sprayed with aniline hydrogen phthalate followed by heating. The sugars were identified after comparison with authentic samples. Table 2. NMR data of flavonoid glycosides from T. terrestris var. orientalis. From the aerial parts of T. terrestris var. orientalis, three flavonoid glycosides were isolated and characterized. The glycosides were found to be based on quercetin and kaempfrol. Compounds 1, 2 showed UV absorption mixture of 257 and 352, 252 which were characteristic for quercetin derivatives. The compound 1 was identified by mass spectrometry, which gave molecular ion peak at m/z 464, corresponding to the molecular formula C21H20O12. Singlets at 6.39 ppm and 6.20 ppm in the 1HNMR spectrum of compound 1 revealed the peaks of 5,7-dihydroxy flavonol. A doublet-doublet signal at 7.58 ppm (J=2.1, 8.3 Hz) and two doublet at 7.69 ppm (J=2.1) and 6.87 ppm (J= 8.3 Hz) showed 3',4'-dihydroxy functional structure corresponding to aromatic β-ring of quercetin. The glycosidic signal shown by 1H and 13C NMR spectra (Table 2) was concluded as -D-glycoside. Therefore, compound 1 was determined to be quercetin-3-O-β-D-glucopy-ranoside (Scheme 1). Compound 2 showed in their 13C spectrum besides quercetin signals, 12 additional peaks attributable for rutinosides. Mass spectrum of 2 gave molecular ion peak at 664 m/z, corresponding to the quercetin-3-O-rutinoside. Compound 3 was characterized by mass spectrometry, which gave molecular ion peak at m/z 448, corresponding to the molecular formula C21H20O11. Two doublet-doublets at 6.17 ppm and 6.36 ppm (J= 1.9 Hz) in the 1H NMR spectrum of 3 (Table 1) showed 2H Ax system in the aromatic A-ring of 5.7-dihydroxy flavonol. Two doublet-doublets at 8.05 ppm (J= 2.1, 9.15) and 6.88 ppm (J= 1.8,9.15 Hz) and the 1H NMR spectrum of 2 also revealed a AB system in the aromatic ring β because the integration showed four protons in this AB system. Those data indicated that 3 had kaempferol as on aglycone. 1H and 13C NMR spectra of 3 shown glycosidic signal that was concluded as β-D-glucoside. In conclusion, three flavonol glycosides have been isolated from T. terrestris. One of them (3) was reported for the first time from T. terrestris. Scheme 1. Structure of flavonoid glycosides isolated from T.
This research was partically supported by grant from Iran chapter TWAS. El-Hadidi MN. Tribulaceae as a distinct family. Cairo: Pulbic Cairo Univ Herb, 1977; 7-8: 103-8. El-Hadidi MN. Zygophyllaceae. In: Rechinger KH, (editor). Flora Iranica, Graz: Akademische Druck und Verlagsanstalt, 1972; 98: 12-8. Xie ZF. S., Huang XK. Dictionary of traditional chinese medicine. Hong Kong: Commercial Press. Ltd. 1988; pp. 205. Brown GA, Vukovich MD, Martini ER, Kohut ML, Frank WD, Jakson DA. Endocrine and lipid responses to chronic androstenendiol-herbal sup-plementation in 30-58 year old men. J Am College Nutr 2001; 20, 520-8. Adiomoelja A. Phytochemicals and the breakthrough of traditional herbs in the management of sexual dysfunction. Internat J Androl 2000; 23 (Suppl. 2): 82-4. Liu Q, Chen Y, Wang J, Chen X, Han Y. Preventive effect of Tribulus terrestris L. on genetic damage. Zhonggno Zhong Yao Za Zhi 1995; 20: 477-9. Deng Y, Yang L, An SL. Effects of Tribulus terrestris: Decoction of different concentrations of tyrosinase activity and the proliferation of melanocytes. Di Yi Jun Da Xue Xue Bao 2002; 22: 1017-9. Nandal SN, Bhatti DS. Preliminary screening of some weed shrubs for their nematocidal activity against Meloidogyne Javanica. Indian J Nematol 1983; 13: 123-7. Antonio J, Uelmen J, Rodriguez RS, Earnest C. The effects of Tribulus terrestris on body composition and exercise performance in resistance-trained males. Int J Sport Nutr Exerc Metab 2000; 10: 208-15. Wang Y, Ohtani K, Kasai R, Yamasaki K. Steroidal saponins from fruits of Tribulus terrestris. Phytochemistry 1997; 45: 811-7. Tribulus terrrestris. Planta Med 2000. 66: 545-50. Wu G, Jiang F, Zhu D, Wu H, Jiang S. Steroidal glycosides from Tribulus terrestris. Yan W, Ohtani K, Kasai K, Yamasaki K. Steroidal saponins from fruits of Tribulus terrestris. Phytochemistry 1996; 42: 1417-22. Tian-Shung W, Li- Shia S, Shang- Chu K. Alkaloids and other constituent from Tribulus terrestris. Phytochemistry 1999; 50: 1411-5. Saleh NAM, Ahmed AA, Abdalla MF. Flavonoid glycosides of Tribulus pentandrus and T. terrestris. Chopra SRN, Badhwar RL, Ghosh S. Poisonous plants of India. New Delhi: Academic publisher. 1984; pp. 257-63. Kirtikar KR, Basu BD, An ICS. Indian medicinal plants. Lalit Mahan Basu 1984; 1: 419-24. Ali NA, Julich WD, Kusnick C. Screening of Yemeni medicinal plants for antibacterial and cytotoxic activities. J Ethnopharmacol 2001; 74: 173-9. Al-Ali M, Wahbi S, Twaij HS, Al-Badr A. Tribulus terrestris: Preliminary study of its diuretic and contractile effect and comparison with Zeo mays. J Ethnopharmacol 2003; 85: 257- 60.